The decision to enter the seminary to discern was gradual; beginning when I was young, fading away, then periodically renewing again when I was older. Ultimately, I entered discernment for the priesthood because I am in love with God and the Church. Throughout my life God’s love has been an assurance, a safeguard and a wellspring of hope, especially in those moments in my life that were particularly dark and challenging. God has given my life meaning and focus, so I figured it made sense to follow what was obviously most important. I also sought to show others the immense love that I have experienced. With that in mind, discerning the priesthood seemed rather natural. I honestly have been blessed with both wonderful family and friends. I don’t think a man could ask for more loving, supportive and genuine people. My family is devoutly Catholic and shared their devotion with me by clear instruction and by virtue of their witness. They have been tremendously supportive of me and my decision to enter seminary. My friends, too, are admirably faith-filled. They are fulfilled by their relationships with Christ, which is a joy to see. They also have been wonderful throughout my discernment. A little bit of anything that has to do with working with my hands. My father taught me woodworking when I was young, and I have remained passionate about that, making anything from furniture to small trinkets. I also worked as a blacksmith before entering seminary, which I loved. I also love music, particularly traditional Irish music, and I can play some instruments. Then there’s reading and writing, which I enjoy as well. My mom recently taught me how to knit, so we'll see how that goes. I think the best way to describe life as a seminarian is a wonderful adventure. It is exciting and fun, with new experiences at every turn. There are numerous challenges and it can be difficult, but that's the nature of an adventure, it becomes worth it when there is good worth striving for. I have met many good and godly people while a seminarian, particularly my fellow seminarians who really create a fraternal community. I have learned amazing things and have had great unique opportunities. I wouldn't trade my time as a seminarian for the world. 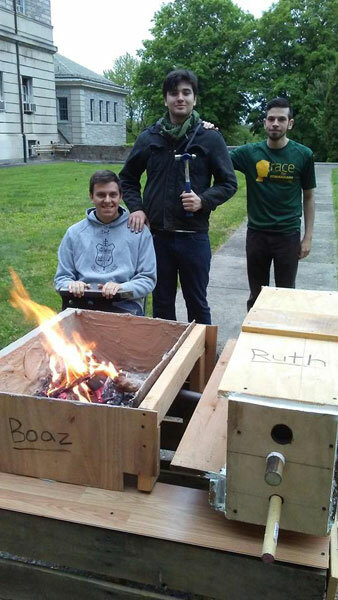 Alexander Brown, center, prepares to create an object from wrought iron using a coal fire while engaging in one of his hobbies as a blacksmith.